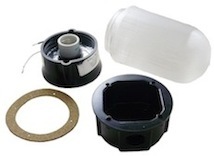 EPCO's Ceiling Mount Luminaires with Junction Box are ideal for Hog and Poultry Confinement Buildings. UL Listed. File Number: E182610. Suitable for use in damp locations ONLY. Meets the requirements of the 2017 National Electrical Code: Articles 314.16(A)(2), 314.17(C), 410.10(A) and 547.5(C)(1)(2) and (3). 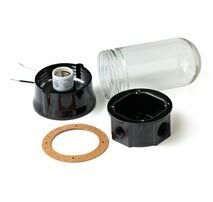 Includes porcelain E26 lamp socket with corrosion resistant nickel-plated brass screw shell. High impact, corrosion resistant, compression molded phenolic junction box and luminaire base. Standard and Tempered Glass Globes rated for "A" Series incandescent lamp (150-watt maximum). Polycarbonate and Acrylic Prismatic Globes rated for "A" Series incandescent lamp (60-watt maximum). 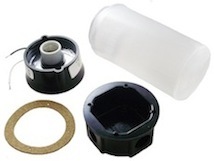 All Ceiling Mount Luminaires are supplied with cork gasket, corrosion resistant screws and rubber washer. Wired with 194°F (90°C) minimum supply wires (THHN). NOTE: Meets the requirements of the Minnesota State Board of Electricity Electrical Wiring requirements for Agricultural Buildings.